Australia recognises that good mental health and well-being supports improved social, educational and economic outcomes. As a result, each state in Australia is required to produce a ten year mental health strategy. Simone works for the Queensland Mental Health Commission and in 2014 was tasked with developing and implementing the early intervention, promotion and prevention elements of the Queensland strategy. The goal was to create a population with improved mental health and well-being, using a human-centred, long term strategy of active engagement. Simone needed to identify a way of engaging a range organisations in the mental health promotion agenda, and build their capacity to promote well-being in their communities in a systemic and sustainable way. WoW was a programme that could be used both as an off the shelf option and a bespoke one. "Three regional Mental Health and Well-being hubs were established across Queensland to nurture and connect communities to enable them to flourish and build resilience." In November 2014, a one day WoW workshop was run with 27 people from a range of community organisations. At evaluation, 99% of attendees intended to make changes to their practice or workplace as a result of the workshop. In response to this success and the excitement created by the workshop, the commission ran a small grant programme and encouraged applications, from organisations such as IMPACT. Having seen the potential of WoW to engage communities around well-being, the commission launched an ambitious capacity building programme. Three regional Mental Health and Well-being hubs were established across Queensland to nurture and connect communities to enable them to flourish and build resilience. The hubs piloted a locally-led approach to building and embedding awareness, knowledge sharing and capacity building for improved mental health and well-being. Hubs worked with individuals, community groups, networks, industry and government across their regions to pinpoint community needs and facilitate better access to mental health and well-being training and resources. Engage: In March 2016 a tailored one day WoW workshop for community and local government organisations, followed by a two hour taster session with the Department of Education and Training (DET) mental health coaches to provide a broad understanding of the programme. Evolve: In September 2016 a condensed version of the DIY happiness programme was run for 15 people from the hubs and 10 DET Mental Health Coaches. 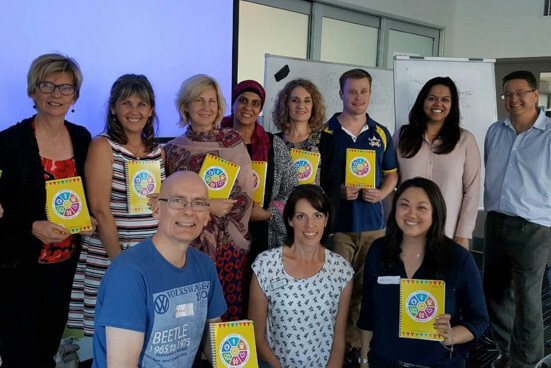 Support was provided for the graduates of the DIY Happiness programme to deliver four one day WoW workshops to schools, for senior management teams and relevant communities, in remote and rural queensland. Sustain: There is ongoing Skype, phone and email support from the WoW team for graduates of the Queensland DIY Happiness programme, as well as resources and information available on the WoW website. Three regional hubs have been established across Queensland to support local communities on the ground. From June to October 2017, a DIY Happiness train the trainers programme and a WoW network to share good practice and ideas was established. The WoW programme aligns with the identified need for effective ways to shift the focus from mental illness and pathology, to greater awareness and engagement with positive concepts of mental health and well-being. As a result, WoW is spreading fast across Queensland. WoW champions have been appointed in NGOs and the DET. The Central Highland regional council have identified their own funding to send their staff on the next DIY Happiness programme, and there are WoW related activities taking part in the three regional hubs and a number of schools in Queensland.